This week has been busy again, so we didn't have much time to focus on the letter X. After this weekend, things should settle down. I'm very much looking forward to that. I've been feeling a bit overwhelmed lately. Exhausted!! Our projects centered around the theme of Xerox. Spencer absolutely loved making photocopies. We'd scrounge around for items to copy, and then he'd get eye level with the printer and wait for the paper to come out. We even copied our hands. Now my black ink is almost depleted. I cut the objects out, put double stick tape on them and we made a few projects out of these. The first was the standard letter X to go on his door. Another was a collage. The last was a poster of our hands. We had another small pregnancy scare this week. This time it wasn't my paranoia; it was the doctor being cautious. I was measuring at 30 cm instead of 32. He likes to take precautions whenever his patients measure too big or too small, so I went in for another ultrasound. I've lost count on how many ultrasounds I've had so far this pregnancy, but it's been a lot. I'm not complaining; I love seeing my little man!! 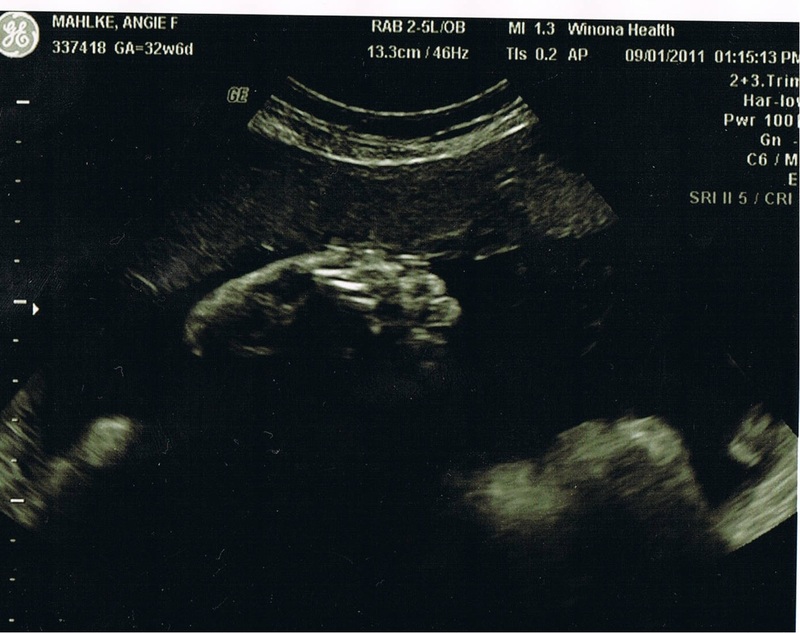 According to the sonogram tech, there isn't anything to worry about. The baby is actually measuring big. 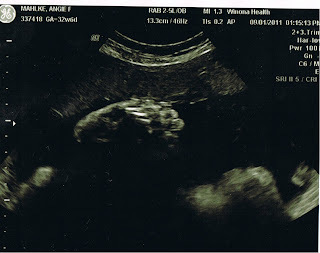 She calculated the due date to be October 16, instead of 21 (I'm OK with that!!) and he weighs in at a little over 5 lbs now. I'm thinking I'm having another big baby!! The little guy wasn't very cooperative; he was being shy. Well, he wouldn't show us his face long enough to get a good picture. Yet he didn't hesitate to give us a very good shot of his man parts! Yes, he is indeed without a doubt a boy. 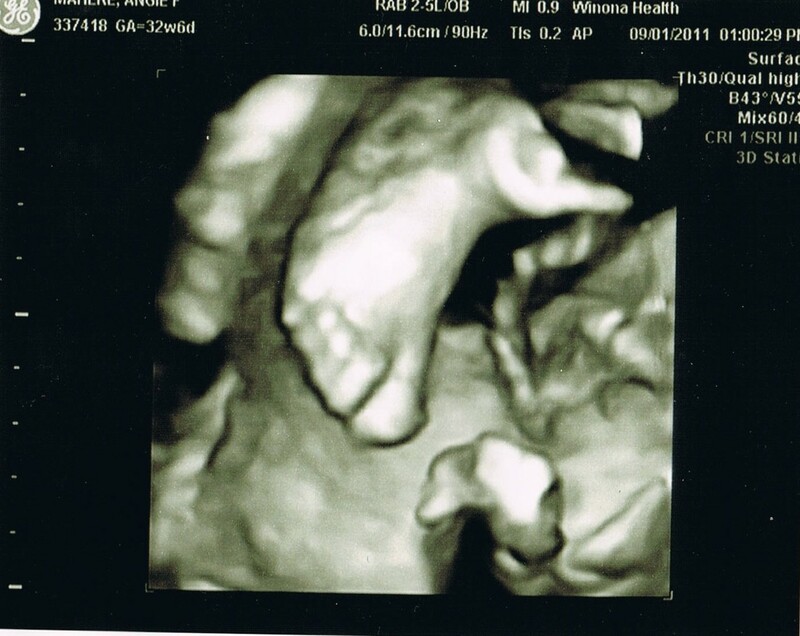 We did get a few pictures, but only of his feet and hands. 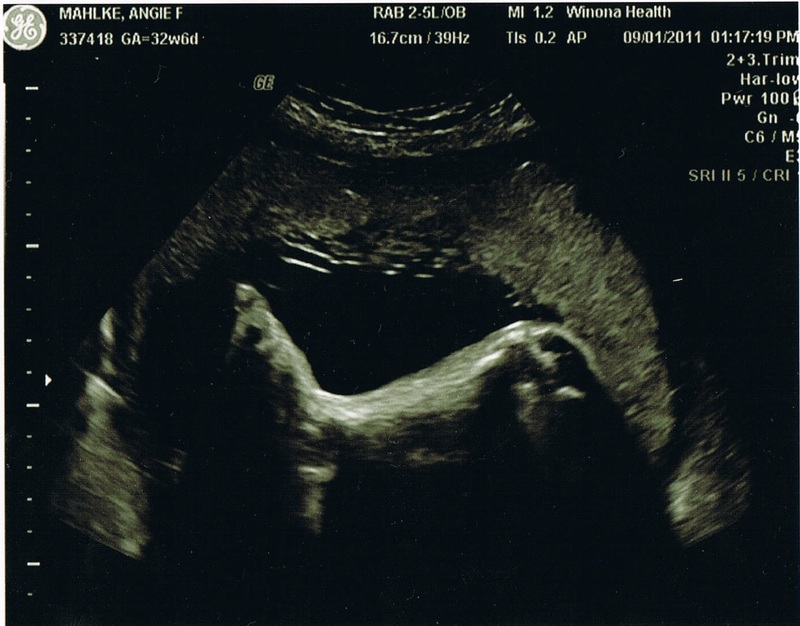 At this stage in the pregnancy, the baby is just too big and it's much to hard to get good pictures. I'm OK with that, though. 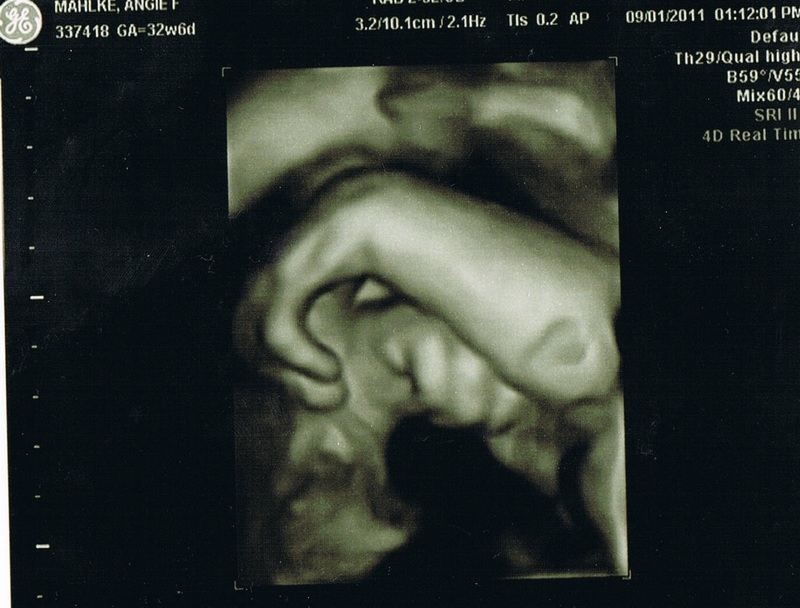 I was elated just watching my baby move (and feel it at the same time). We were able to see him "breathing" (or what the tech explained as him practicing breathing since they don't technically take their first breath until they are born), which I guess is rare at this stage. And we saw all four ventricles of the heart beating (at about a rate of 140, which is where it's been most of the pregnancy). We can rest assured and breathe easy that the baby is growing and developing right on track, if not a bit ahead of schedule. Now if we can go the rest of the pregnancy without any more scares!!!! I hope everyone has a fun Labor Day weekend!! We are staying in a 3 bedroom cabin with two other families. One baby, 3 toddlers, a tween, and 6 adults (one of which is pregnant: me)! It should be an interesting time.